Peplum is definitely one of my favorite trends this season- it can be worn several ways, it's very feminine and it gives you the right curves (specially if you have a rectangular body- also, if you have an inverted triangle body, I totally recommend peplum skirts; they balance your body by giving the illusion of hips and a smaller waist). This time I decided to wear my light celeste top with simple white jeans and a couple of turquoise details in the bag and earrings. Since the outfit was very "white" , we wanted to find a colored wall to make the outfit pop more. We went to Midtown Miami, which is full of fun walls and graffitis- as soon as I saw this purple wall, I was in LOVE! After having a late lunch, I stopped at Furor Moda's place to check out this week's new items! Hope you liked this look and that you are having an amazing weekend! El "peplum" es una de mis tendencias favoritas esta temporada; puede usarse de muchas formas, se ve muy femenino y marca tu figura (recomendable especialmente a las mujeres con cuerpo rectángulo- si es peplum en falda le da equilibrio a las "triángulo invertido" ya que da la ilusión de más caderas). En este caso quise usar esta camisa peplum celeste con unos jeans blancos sencillos y algunos detalles turquesa en la cartera y los zarcillos/aretes. Como el outfit era de colores tan claros, quisimos buscar una pared de color vivo para que contrastara- dando vueltas por Midtown, donde hay muchas paredes de graffitis y colores, vimos esta pared espectacular morada que considero que fue perfecta para el look. Después de ir a comer, fui a Furor Moda a ver las cositas que vienen la próxima semana en el website! ¡Espero que les haya gustado este look y que estén pasando un bonito fin de semana! i love this outfit! i hate peplum on most people -- yuck -- but you make it work and look cute here. you also made it work with your lavender jeans several posts back (loved that look!). the starfish ring is gorgeous! i have two starfish cuffs (silver and gold) that i get a lot of compliments on. summer is almost over but i may get the ring for next summer. i like your hair like this too...looks much more natural than the glam curls and is refreshing change! Me encanto el look! 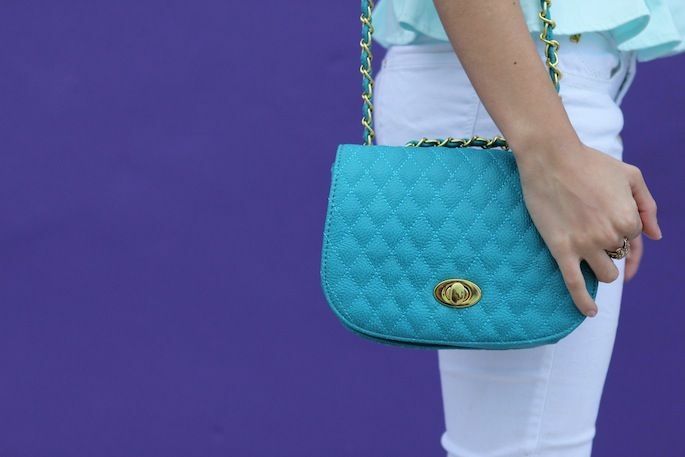 En especial la combinacion de tonos pasteles, y la bolsa, que le da un poco de color al outfit. Estas linda como siempre :). LOVE this! The mint with the turquoise is to dye for! The pictures are gorgeous! LOVE the purple wall with the mint and white! And that bag is stunning! For some reason this look doesn't strike me as something you would typically wear. I think it's the earrings (which are so pretty! ), or maybe just the fact that you have a purple wall behind you and that's not typical of your photos. Still, you look as fabulous as always, and I totally love the purple wall too! Great contrast, amazing pictures. I have a peplum top from Modcloth that I still have to wear... I just don't know what to wear it to, haha! An unemployed first year grad student can't afford to do much in Miami, and peplum is so cute and dressy that I feel like I have to wear it somewhere at least a little bit special. Well, I'll stop rambling now! P.S. I was gonna go to the Lookbook/ Gap event (it was gonna be my first event as a blogger!) but it was my nephew's birthday. Oh well, there's always a next time. Sooo cute outfit! hermosos colores! LOVE this look on you! LOVE peplum! The contrast wall makes this outfit look amazing,love it.its so diffenrent but in a good way,te vez bellisima Dany. I love peplum top too and i hope it will stay for a while. Lovely colors and peplum top! I think you look so cool! This colors are so amazing!!! Will be happy if you like my FB page! En tu caso, me ha encantado la camisa peplum, tiene un color precioso y no le pudiste buscar mejor fondo. Estupenda, un 10 para Nany!!! I love the colors and your top! Beautiful look, love the ring and the shoes!! Love your blog Dany. I love that we both have the same first name! The peplum top looks so cute on you. I love this peplum trend too but I can't seem to find the perfect one. It's so cute so I'm definitely going to keep looking for one. You looking fab Daniela as usual. So cute! I don't know why but the pics seem a little retro,love it. So chic. I love the pop of color here. Classically styled. Such a sweet outfit! Love the peplum top and that pairing with blue accessories! The whole pastel look is very fresh and feminine! Es precioso el look! muy delicado y con personalidad, tienes un estilazo impresionante! !